This 14K white gold engraved hearts aquamarine ring captures the beauty of the love that refreshes your heart and presents it in sweet, sophisticated fashion. The 6.5mm amethyst that rises from this piece provides an invigorating splash of light blue sparkle. 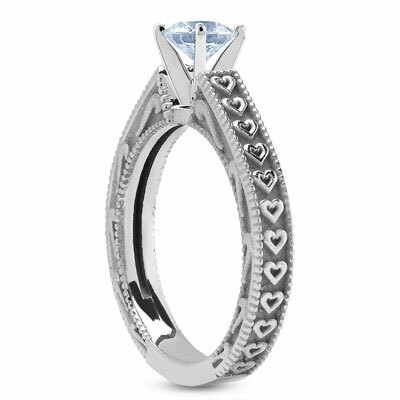 This round gem is held by four prongs to a 14K white gold band that's rich with symbols of love. A neat little row of carved hearts adorns the outer surface of this band, while swirls accent the sides. A crystal blue aquamarine is set in a 14K white gold setting with a heart design. Also available in 14K Rose Gold, 14K Yellow Gold or Platinum and 1 Carat by request. 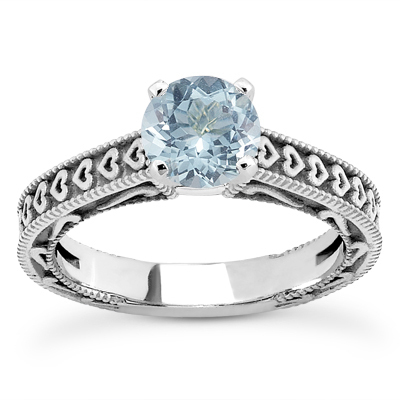 We guarantee our Engraved Hearts Aquamarine Ring to be high quality, authentic jewelry, as described above.